Home > Baby Deals > Luvs Coupon | 10¢-17¢ Per Diaper at Food Lion! 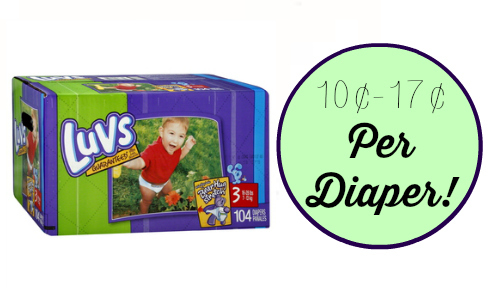 Luvs Coupon | 10¢-17¢ Per Diaper at Food Lion! There is going to be a great deal on Luvs diapers at Food Lion next week! Go ahead and print (2) copies of this coupon to get the deal. You can learn more about stocking up on diapers here. That makes it $9.49 a pack or 10¢-17¢ per diaper! !